Dan Migala is always thinking. The co-founder and chief innovation officer of 4Front Sports and Innovation Consulting Firm is the guy behind the Chicago White Sox’s 7:11 starting time – brought to you by 7-Eleven, of course. He’s also the marketing whiz who brokered a deal between the San Diego Padres and TaylorMade golf clubs to erect an 88-foot-tall golf club connected to the foul pole at Petco Park. It’s wild brainstorms like these that put smiles on people’s faces, attract national media attention, create amazing amounts of brand recognition and, above all, keep the bosses happy. 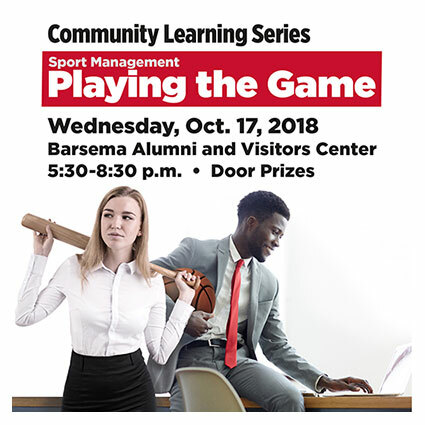 Free and open to the public, the Community Learning Series takes place inside the Barsema Alumni and Visitors Center, 231 N. Annie Glidden Road. A reception with hors d’oeuvres begins at 5:30 p.m. Call (815) 753-1407 or email knpe@niu.edu for more information. 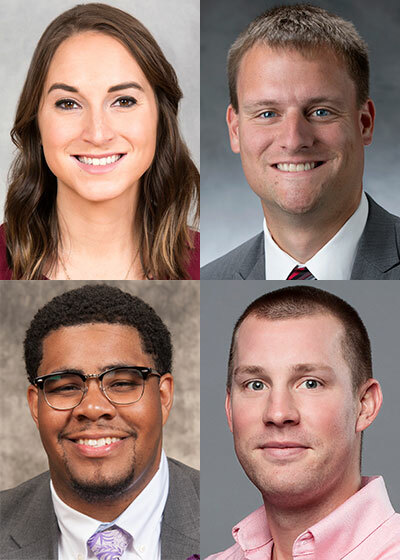 Because the evening is primarily geared toward highlighting the rewarding career paths available in sport management, organizers have engaged three alumni of, and one current student in, the master’s degree in Sport Management program to participate in a panel discussion. Top: Allison Einhouse and Matt Gonzalez. Mike Olejniczak (M.S. ’11) is account director/client services for GMR Sports Marketing. Steve Howell, associate professor of Sport Management and director of Graduate Studies for the Department of Kinesiology and Physical Education, says this installment of the Community Learning Series will lift the hood to show the engines that power sports. Einhouse, Gonzalez, Neely and Olejniczak are “Huskies who’ve done quite well in the early stages of their careers,” he adds. Highlighting the early-career success stories will resonate well with students, says McEvoy, whose specialty is also Sport Management. “In our Sport Management classes, our students get the opportunity to interact with, and learn from, a variety of industry speakers. 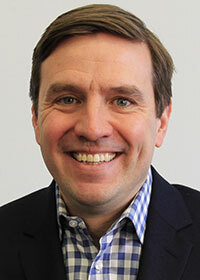 I find that it’s not always the ones that are in the most impressive titles later in their careers but rather the ones who are a little closer to our students in terms age and career path that they relate better with,” McEvoy says. McEvoy and Howell are proud of the master’s-level NIU Sport Management program and its alumni, who leave NIU prepared in sport marketing, sport finance, sport law, sport sales and more. The department will launch a bachelor’s degree in Sport Management next fall, a move that will add to the legion of successful graduates.